In here, you’ll find a treasure trove of options to make AutoCorrect work for you (instead of against you as sometimes happens). For instance, you can add additional text replacements strings. Let’s say you often type the letters O O T B (without the spaces) to mean “Out-of-the-box”. 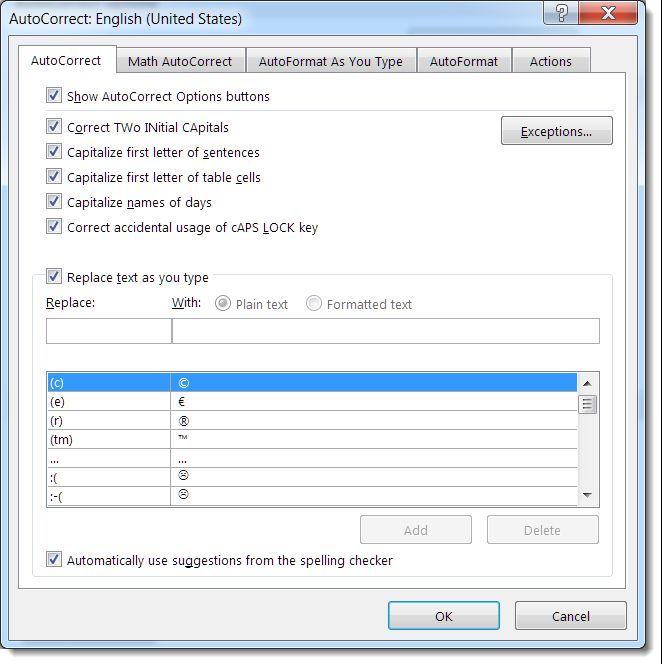 Using the Replace Text As You Type option, you can have Office replace the spelled-out term whenever you type those four characters together. The other tabs at the top of the dialog box also have some cool options, such as whether you want web addresses to turn into hyperlinks and if you want new bullet points to be added when you hit Enter while typing into a bulleted list. Take some time to check it out and see if you can save yourself some time and keystrokes in your day-to-day work.